O Help of Christian protect us! Bright Star of the Sea guide us! That prayer was very much in my mind over the Synod weekend, 15–17 September, of the Archdiocese of Wellington. The formal part of the Synod began on Friday 15 September, the Feast of Our Lady of Sorrows. I had already published the results of the consultation process in the Synod Members’ Booklet on the Solemnity of the Assumption, 15 August this year, and I had formally convoked the Synod for the Archdiocese on the Feast Day of the Archdiocese last year, 8 December, the Solemnity of the Immaculate Conception. There was no doubt this Synod had been entrusted to the prayers of Mary. I was therefore very pleased to be able to convoke the sixth Synod of the Archdiocese so that all of us together could “strengthen cooperation in all areas of her (the Church’s) mission”. We chose to do that by listening prayerfully to what the Spirit of God was saying to us, and by listening prayerfully and respectfully to one another. I was delighted over the weekend to hear so many Synod participants saying how much they appreciated the ‘discernment process’ and how they wanted to use this process in other ways in parishes, schools and colleges. I believe we have been truly blessed in this diocese to have used this process, and for the Synod to have made 96 recommendations to me. Those recommendations will now be reflected on, prayed with, and discerned even further as I look at making pastoral plans for the future. us all as we respond to the call ‘Go, you are sent’. It helps us to realise and be inspired for the mission which is ours. There is no doubt in my mind that the Holy Father’s prayers and blessings were with us over the many months of build up to the Synod and over the weekend itself. The weekend was a great blessing and has given hope and direction to the Archdiocese. I express my deep gratitude all who participated, all who planned, all who prayed. I am sure that all the hard work of the Synod will enable us to be ‘authentic missionary disciples’. John A. Cardinal Dew, Archbishop of Wellington. At the conclusion of the Synod Mass, celebrated at the Metropolitan Cathedral of the Sacred Heart on Sunday 17 September, Cardinal John Dew thanked all participants and recited this prayer. to give God thanks always. to do your job well. to enjoy this life’s pleasures and promises. to love, and to love some more. Go, you are sent. You are sent. You are sent. Pope Francis’ desire is that we have a synodal Church throughout the world and that we advance along the path of a pastoral and missionary conversion, which cannot leave things as they presently are. Cardinal John Dew called a Synod for the Archdiocese to help shape and lead its future direction for coming years. 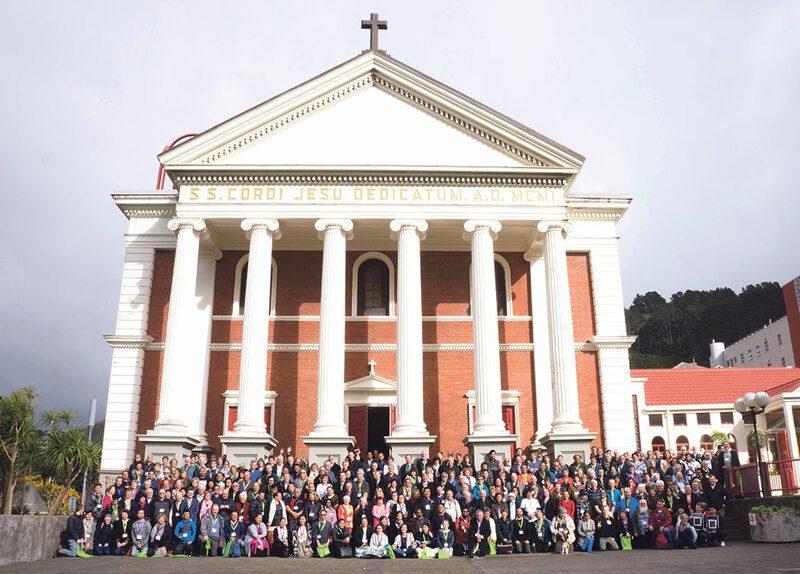 Over 300 participants from parishes, schools, religious orders and Archdiocesan bodies gathered in Wellington for the Synod ’17 weekend, 15 to 17 September 2017. They met at Sacred Heart Cathedral, Sacred Heart Primary School, St Mary’s College and the Catholic Centre. There were 11 Synod topics for the participants to provide recommendations to Cardinal John. The topics had been decided through an Archdiocesan-wide consultation process earlier this year. The Synod opened with Vespers at the Cathedral on Friday evening, which included a mihi whakatau, reading in te reo Māori, and music from the Cathedral choir. On Saturday and Sunday young people prepared and presented the opening Liturgies for each day. Throughout the weekend, participants rotated in groups to listen, reflect and discern the 11 topics. By the end of the Synod weekend they had presented over 1200 resolutions, which were summarised to recommendations and presented to Cardinal John. After considering the recommendations Cardinal John will promulgate his findings. These are expected to be delivered to the Archdiocese over coming weeks. A Mass was concelebrated on Sunday afternoon to conclude the Synod. Cardinal John thanked everyone for their hard work of listening, sharing, reflecting and putting the recommendations together.